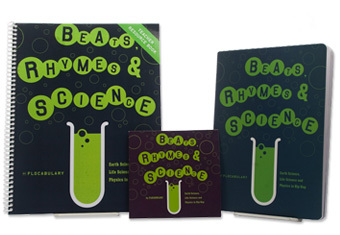 The songs on this CD take standards-based science content and put it over catchy beats. Difficult science content has never been so accessible. The student textbook and CD form a comprehensive review of middle school science topics, perfect for test preparation or as a classroom supplement to more traditional methods. The book and CD cover the science that is tested in 8th grade in most states, including Earth science, life science, basic chemistry, physics and astronomy. The Teacher Resource Book includes lesson plans, support materials, terms sheets and unit assessments that mirror those on state tests. And every 12 months make a revolution. As I rotate change into night. The Law of Inertia is governing the movement. The path that I’m destined to have until it breaks. I’ve been orbiting way more than any person lives. Run around the sun with the moon on my back, homie. The tilt of my axis controls the seasons you know. Or then I lean back and it’s chillier than normal. Surprise, the heat of the summertime arrives. People there enter into winter. The sun appears to rise, in the west it descends. And it always stays cold. Longitude and latitude will keep you en route. ’Cause there is no direction, there is no escape. Even still - the sun is 300 times more massive yo! Regal, at the center of the solar system. Known for being rocky and small not large. But farther and past is Pluto, a dwarf planet made of ice. Its gravity controls tides too. Move! Before the asteroid hits. Meteor, comet! But we were a bunch of AU’s from it. What? Measured in astronomical units is ONE!